The Converse Blog: The Converse Blog: Pro Leather 1976 Sample and new Poll. The Converse Blog: Pro Leather 1976 Sample and new Poll. Not to push your week back or anything, but today is going to be my Monday for the week. Sorry for the lack of post yesterday, but hopefully I can make it up to you today with a wild sample you've never seen. These are a sample pair of Converse Pro Leather 1976. The best way I can describe these is Tropical Fruit Camo. Also I just found out that my long term sub gig is coming to an end, sort of. The teacher I am subbing for is working his way back from hip surgery, and is starting back on Wednesday working half a day. Which means I get to go in for 1st and second block and then leave at 11:30. Of course I am only getting paid for half a day, but I am still excited to keep teaching. Regardless, things should pick back up around here, which I am oh so excited about. To help kick things off correctly, I posted up a new poll last night for all of your voting pleasure. Also I'd like to speak on the info leaking out that Dwyane Wade is unhappy with Converse, but I am not sure how I feel about it. Honestly, I hope it's much to do about nothing but only time will tell. I'll hold the rest of my thoughts on that for now. Well that's it for today, thanks for checking out the blog. Don't forget to vote on your way out! Labels: Basketball, Blog, Converse, Dwyane Wade, Poll, Pro Leather, Teaching, vote. 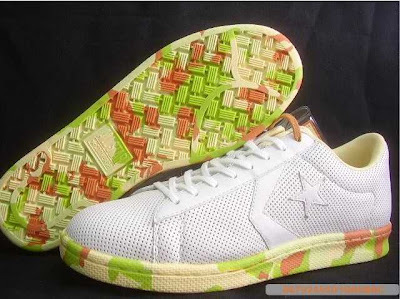 FYI: the Weapon Hi and Lo were supposed to be available for Converse One in Fall 2008. Just went to the site this morning, now it says Spring '09. Talk about a cop-out. Interesting post as for me. It would be great to read something more about this topic. Thnx for giving that data.